This model is just as durable, ergonomic and manoeuvrable as our Gas Cylinder Trolley (CTS01), allowing you to handle cylinders with minimal effort. It also has the added feature of a lifting hoist, so you can lift the loaded trolley from the ground to move it onto different levels. A fixed clamping band keeps the cylinder secure in the trolley while you hoist it. Manufactured in the UK, we build all of our gas cylinder trolleys using corrosion-resistant stainless steel. Thousands of our units are in use across the industry, and many are exposed to harsh environments. By using the best stainless steel we ensure that our trolleys are durable, providing you with reliable and long-lasting equipment. The small wheels at the front of the unit enable you to tip the gas cylinder lifting trolley upright; you can then move the baseplate under the cylinder before tilting the gas trolley back into the resting position. The four main wheels offer exceptional manoeuvrability, allowing you to tackle small steps with ease. To keep the cylinder secure in the gas bottle trolley when you’re using the hoist, we’ve fitted the unit with a fixed clamping band. The band holds the cylinder in place and has a single removable locking pin. The band supplied is suitable for cylinders with a diameter of 230mm (+/-10mm). We build the gas cylinder trolley with a fully tested and certified lifting hoist. Once you’ve secured the cylinder into the gas trolley with the clamping band, use an overhead crane or derrick to lift them. We can provide fully-certified ATEX cylinder trolleys for use in hazardous zoned areas. Our CTS02-Ex is suitable for gas and dust classified spaces: Zone 1, 2, 21 and 22. When manufactured we ensure electrical continuity, when being used at floor-level a path to ground is always present through the trolley. We supply our ATEX drum handling equipment with a manufacturer’s EU Declaration of Conformity. We can build this cylinder trolley certified to ATEX Directive 2014/34/EU – suitable for use in an ATEX Zone 1 environment. See the full technical specification for our Gas Cylinder Trolley with Lifting Hoist for details such as weight, dimensions and load capacity. 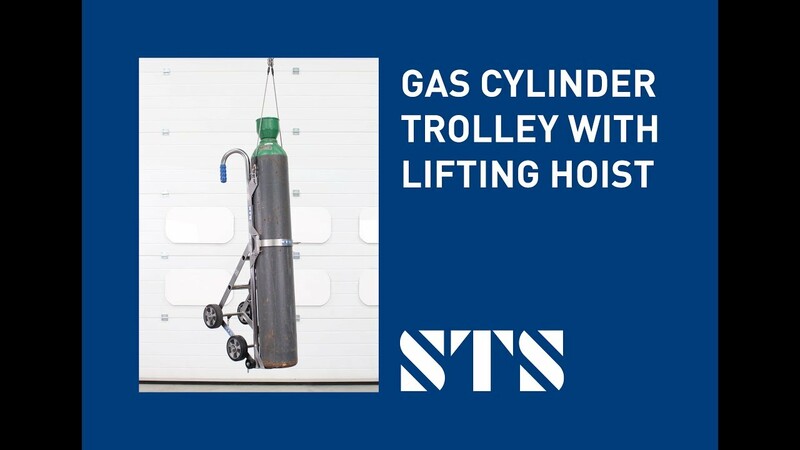 View the instruction manual for our Gas Cylinder Trolley with Lifting Hoist, which details how to safely operate and maintain the unit.